Introducing the best thing to happen to live performance since fingers were invented. Welcome to Emberlight's Multi Touch System (MTS) for the creative who depends on low latency control of applications in a live environment. Large format 46" 16:9 Rear Projected Display. Touch compatible with all computer platforms Win 7, 8, 10, Linux, OSX. Up to 10 point touch. Stand - Lightweight Tubular Steel Construction. Fully collapsible and adjustable. Screen - 46" 4mm thickness Safety Glass; High Contrast or Holo Effect Rear Projection film pre-applied. Touch - 46" 10 Point Touch Infra Red frame ambient light, strobe rejection. Response time <4ms. Projector - 1080p DLP, Full HD. Emulator Modular from Smithson Martin or Touch OSC is recommended for all MIDI control applications for the MTS (available separately). Operates as a Multi Touch device in all common OS environments Windows 7/8/10, Mac OSX, Linux, Android (requires the Android Touch Adapter available now). 100% TUI0 Compatible. If your favourite application supports MIDI, TUIO or Native Touch it will work flawlessly on an Emberlight MTS. GrandMA 2, Venue Magic, WYSIWYG, Martin Show Designer, Softplot, MyDMX, Light Jockey, ShowXpress, DasLight, Chamsys, Chameleon, Madrix, Compushow Laser: Pangolin, X-Laser, iShow, ILDA Laser Control. 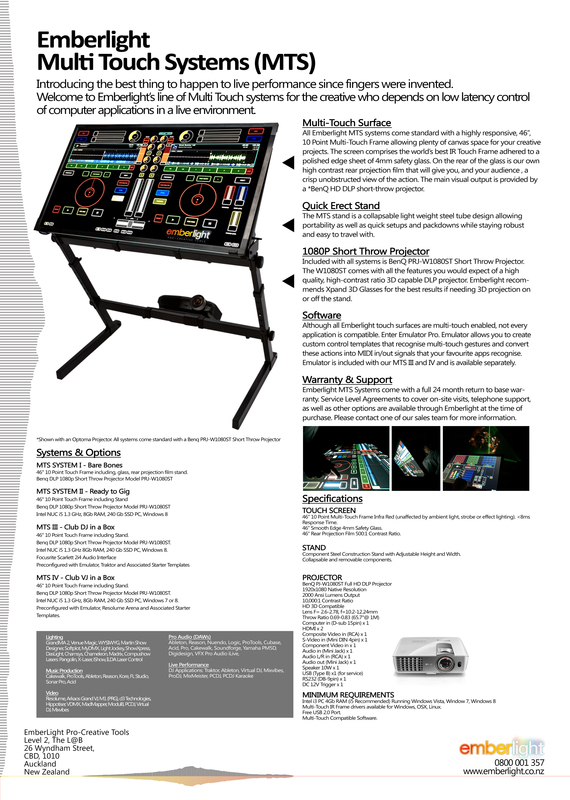 Resolume, Arkaos Grand VJ, M1 (PRG), d3 Technologies, Hippotiser, VDMX, MadMapper, Modul8, PCDJ, Virtual DJ, Mixvibes.